Dr Beth Montague-Hellen started off academic life as a Molecular Biologist studying at Manchester University. The next 14 years were spent as a Bioinformatician, accruing an MSc, a Phd and several postdoc positions on the way. In 2016 Beth retrained as a Librarian, which is a much smaller move for a Bioinformatician than most people would think. 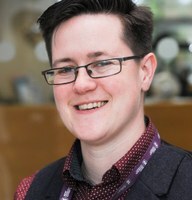 She has since primarily worked in Scholarly Communications and Research Support, recently moving into the role of Senior Research Librarian for Research Data Management at the University of Nottingham.